As I understand it, the SEC requires anyone who manages more than $100 Million in securities to file a 13F report quarterly detailing how much they own of each type of security. They also publish a giant list of securities that must be reported, along with a CUSIP id for each one. The CUSIP ids “are used with permission by Standard & Poors CUSIP Service Bureau, a division of The McGraw-Hill Companies, Inc.” and come with an accompanying prohibition on reuse and redistribution which seems strange for Federal public filing documents. I think that the assets listed are all ownership of securities in “real” companies — so probably excludes index funds, mutual funds, and the sort of complex trading instruments that reportedly lead to J. P. Morgan’s recent newsworthy losses. But i think it is still intriguing to peek at some of the complexity. J. P. Morgan’s file for the end of 2010 states that contains data for 10 managers, so I assumed that the manager number for each row indicates which subsidiary actually owns the security, and summed the value column to control line widths and node labels sizes. The network had ~2k nodes which was kind of busy, so i filtered it down to show only relationships of more than $100,000, reducing it to ~200. I cleaned and formatted the raw filing data in a text editor, processed it with R and ran through Graphviz to create a pdf image. It seems like the total ownership in these forms is greater than the capitalization value of some of the companies. Is this crazy leverage, or am I just double counting somewhere? In some places there is a trail of ownership that leads back to the parent. (These edges are not shown in this image because they were removed by the $100k threshold) Is this hedging or something? There are lots of situations where the various management arms own stock in the same entities. Probably not a serious issue, but must make calculating risk exposure to specific securities really hard. This bank seems to own stock in lots of other banks, each of which probably has an equally complicated network of overlapping security ownerships. As might be expected with any real-world data, The CUSIP ids seem to have some format errors, and the names of companies don’t follow consistent spelling and normalization with the SEC’s CIK names. 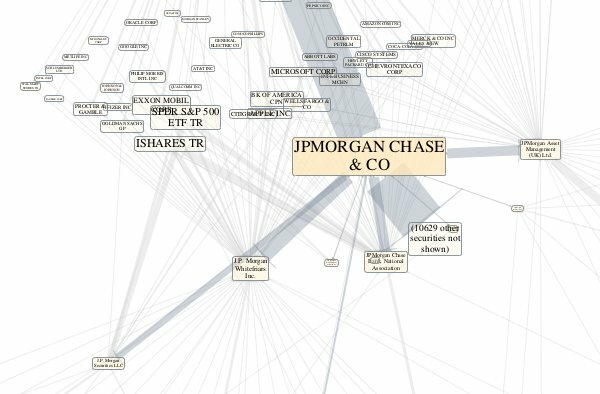 Someone in the financial sector wrote via OpenCorporates (http://opencorporates.com) to give a bit more insight into what the 13F filings really mean. A key point being that the ties should be thought of as investment decision-making authority, not ownership. of the asset management division of JP Morgan Chase & Co.
What does this mean? It means that JP Morgan (in common with many banks) has a business that manages other people’s money. The money under management ultimately belongs to individuals, pension funds (who are just agents acting on behalf of a particular group of individuals), endowment funds (who are agents acting on behalf of institutions such as universities, churches, charities, cultural bodies etc…), insurance companies… that pretty much covers the largest categories of ‘beneficial owners’ who will make up the clients of JP Morgan’s asset management division. This observation clears up most of the questions raised on the blog, although it does raise other interesting ones about how the ultimate beneficial owners of a company can influence its corporate governance when an agent (the asset manager) is acting on their behalf – a classic principal/agent dilemma. Various management arms owning stock in the same entities is normal in a large asset management business, and it is not unusual or suspicious for a sufficiently large asset manager to have invested some of their client assets in shares of the asset managers parent company, if that parent is a public company. It is also to be expected that a large asset manager owned by a bank will have invested a reasonable amount of client assets in other banks – after all, banks make up a significant percentage of the equity market.